Every year for Carols there seems to be a new song (or at least new to me) that totally frames His Story and the message we are trying to convey. This year, that song is “Be Born In Me and is being sung with such conviction by a young mom named Brittyne Aven. And as she prays, she comes to terms with what she has to do. Failure to obey is not an option. She gives all that she has to offer – a vacancy in her heart that will be filled with her love for the Child of God! Peter got it. Toward the conclusion of His earthly ministry, Jesus asked His disciples who people thought he was. They gave varying answers – teacher, prophet. The Christ directly asked Peter that question (Matthew 16:15-16): “But what about you? Who do you say that I am?” Peter’s response: “You are the Christ, the Son of the Living God.” With that acknowledgement, Peter was stating “be born in me”. Barbara Hamilton is our gifted drama director for Carols and other programs. A more humble individual and servant I have never met. 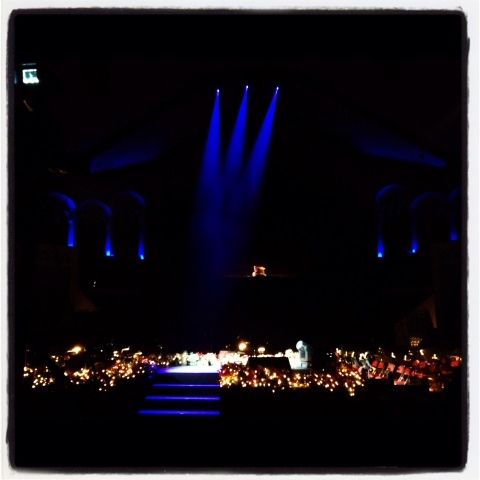 As I watched a lighting run through yesterday, the lighting set for “Be Born In Me” came up. In the scrim box above the choir loft was Barbara, attending to the manger that is used from that location during the processional, thus an unrelated scene for that number. She folded clothes and prepared that “prop” as if she were Mary preparing the manger for the newborn King. Barbara, like Peter, gets it. The King for Eternity has been born in her. Her life reflects His Amazing Love. Does yours?